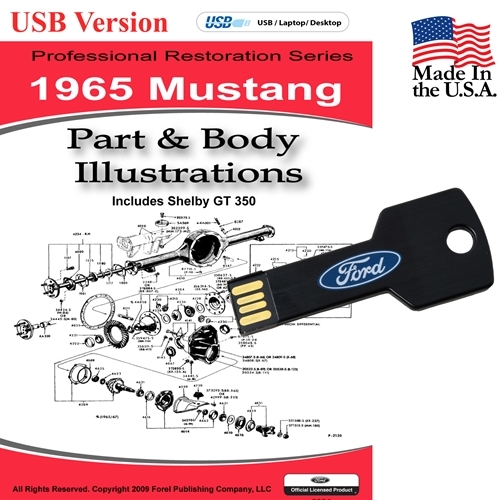 Description: The 1965 Mustang Part & Body Illustrations manual is a comprehensive collection of detailed part and body illustrations that are extremely useful for any restoration project. For example, part illustrations are “exploded” to show not only the parts of a component, but can be used to identify the basic part number of virtually every nut, washer, etc. The exploded body illustrations show the locations of trim pieces, mouldings, weatherstriping, how sheet metal was assembled, etc. How many washers do you need on the Pitman Arm or what direction is the rear axle yoke bearing? Just look up the illustration and see what it look like! Windows, MAC, iOS, and Android - Also now transportable on USB devices.